The great Technical Analyst Martin Pring once said: “The more I work with markets, the more it becomes apparent that prices are determined by one thing and one thing only, and that is people’s changing attitudes toward the emerging fundamentals”. In this article, we shall dig into the fundamentals that market participants care about when dealing with Gold and other precious metals. Gold really is the King of all commodities. Understand Gold, and you can understand all other bullion. As we will discuss further in this article, it really only makes sense to compare other metals’ properties and behaviour to that of Gold. But why is Gold so important? Gold acts more like a financial asset than a physical commodity, even though 80-90% of the global production is used for jewellery and high tech areas like specialized electronics. Gold tends to have an impact on other precious metals like Silver and Platinum, dictating their price. More so with Silver, because Platinum is more tiered towards industrial use. Inflation trends also to affect the demand for Gold, since the precious metal is seen as a hedge against inflation. Now we shall explore each point more in depth. All Central Banks own Gold. Among other reasons, this is due to gold’s historical association with banknotes and coins. In the past, a coin or banknote could be redeemed in exchange for gold. These days, the gold reserve is justified by the fact that the value of gold behaves differently than the foreign currency reserve. Gold is held by reserve managers for diversification purposes, since the value of the gold and foreign currency reserve together is more stable than the value of the gold reserve and the foreign currency reserve separately. Gold can also be used to fund emergency liquidity assistance or foreign exchange interventions, among other things. 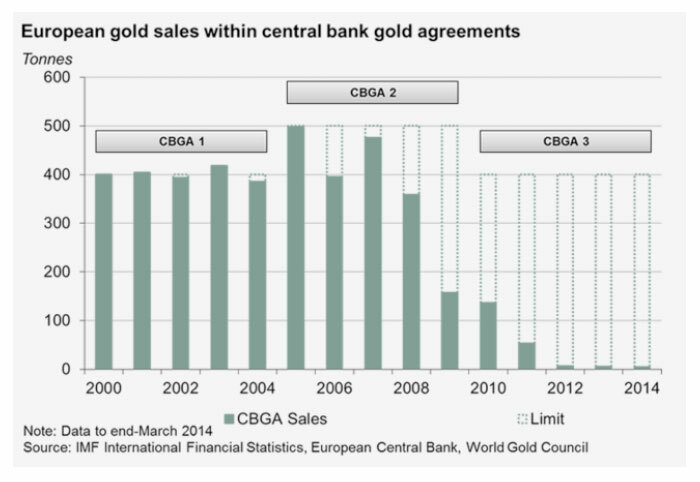 Amongst other things, Central Banks take note of general economic conditions when deciding to buy or sell Gold. Below is a clear demonstration of how Gold is bought during times of economic downturn and sold during times of prosperity. This means that Central Banks have enormous pricing power in Gold, which could be potentially dangerous to other market participants, and to Gold producers. Collectively, at the end of 2014, central banks held around 30,900 tonnes of gold: approximately 20% of all the gold ever mined. These holdings are highly concentrated in the advanced economies of Western Europe and North America, a legacy of the days of the gold standard. In recognition of this, major European central banks signed the Central Bank Gold Agreement (CBGA) in 1999, limiting the amount of gold that signatories can collectively sell in any one year. There have since been three further agreements, in 2004, 2009 and 2014. But what about the other central banks that are not part of this agreement? 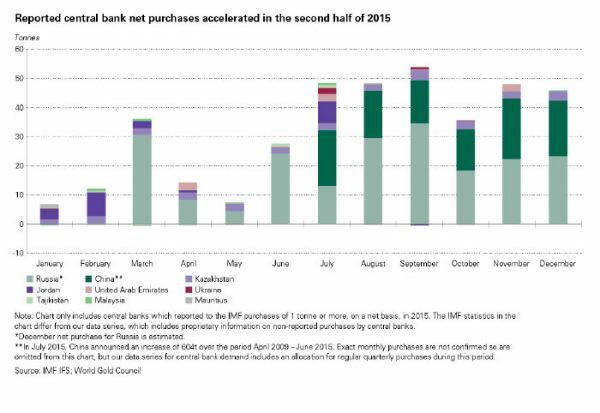 Without a doubt, the Russian and Chinese central banks are also key players in the gold market. 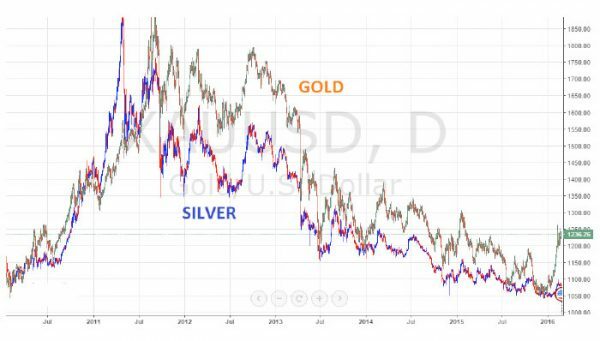 For example, both CB’s raised their allocation to Gold in 2015. Central Banks have the power to influence the price of Gold, more than any other driver out there. However, the question to ask is: do they actively seek to manipulate market prices? In a way yes…but in a good way! 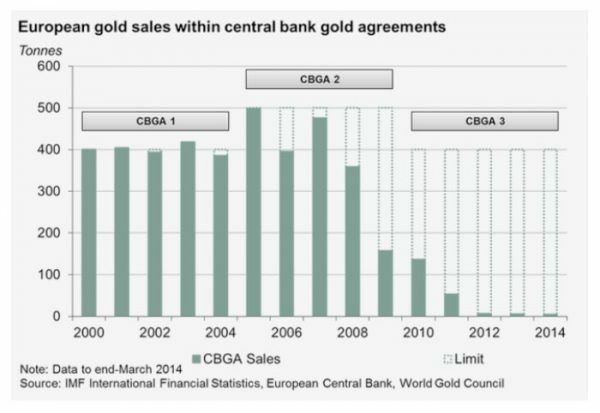 The CBGA is meant to stabilize Gold prices: European CB’s tend to be buyers during declines and sellers during upticks. And CB’s generally want to remain under the radar with their transactions. The “risk on-risk off” dynamic tends to have more importance for intraday and intraweek trading. To understand why, all we need to do is observe a chart of the Dow Jones vs. Gold. It should be evident how, in times of sharp stock market declines, investors flee to the safety of Gold. And this dynamic occurs on the short time frames as well as the larger time frames. So intraday traders should also be aware of this dynamic. 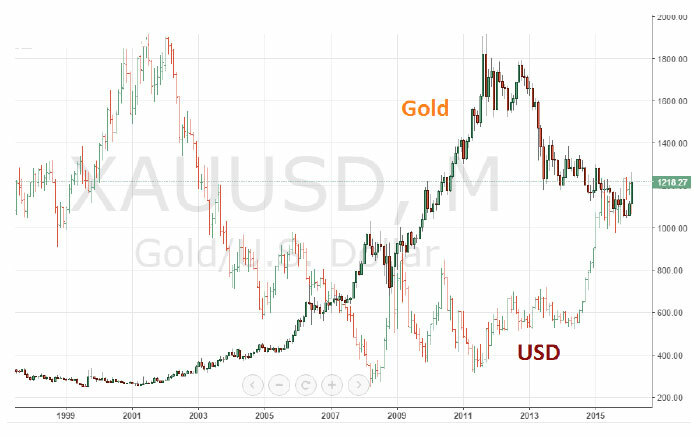 Gold prices tend to increase when the USD gets sold. That is because in relative terms, Gold becomes more expensive. Gold prices tend to decrease when the USD gets bought. That is because in relative terms, Gold becomes cheaper. Below we have the visual description of this dynamic. Inflation describes the general increase in the price of goods & services, and is the reason why 100 USD bought more in the 1990s than today. Inflation erodes the value of savings over time, and decreases the burden of debt to the borrower over time. This is the general reason for interest being applied in both cases. Lower unemployment or stronger economic activity is seen as a potential inflationary trigger. Some other triggers are increases in commodity prices or workers wages. 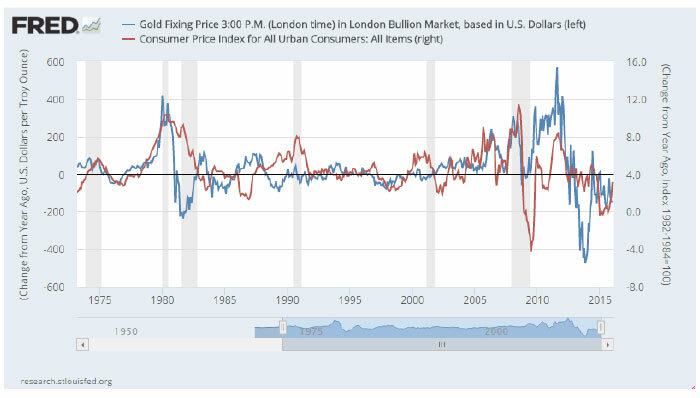 It should be clear from the above chart that changes in the Consumer Price Index (CPI) correlate directly to changes in the price of Gold. Investors actively seek “tangible goods” as a hedge against inflation. There is also a psychological component to this behaviour: currencies, stocks, bonds and ETFs are all “intangible” investment vehicles. They are all “pieces of paper” at the end of the day. So, when the future outlook gets gloomy, investors tend to remember this fact and search for safety in “hard assets”. And that is why hard assets, such as oil, natural gas, silver, farmland, diamonds and real estate all tend to be inversely correlated with stocks and bonds. After having seen these 4 price drivers behind trends in Gold, one might ask: why does it seem that Gold follows each of the 4 main dynamics sometimes, whilst other times it does not? The answer is that like currencies for example, Gold does not trade on one single driver all the time. Depending on the state of the markets, each driver can come into play, and then another one takes its place equally as fast. That’s why it takes time to master trading commodities (and currencies for that matter). Gold/SP500 ratio (weekly) showing how vicious the moves in Gold can be, relative to equites. It might be interesting to know that Silver has a huge array of industrial uses, since it is used in electrical components in computers, and household appliances such as washing machines. It also has less conventional uses, such as in photograph development, and in odour control in shoes and clothes. It is also more commonly being used in trace amounts in bandages, and is still used in X-rays. Silver tracks Gold. The price dynamics are very much the same, albeit with different volatility characteristics. Hence, for trading objectives, Gold remains more appealing given the higher volatility. Palladium has a wide variety of uses, and thus appears in a number of consumer and business markets. While both Palladium and Platinum enjoy the status of “luxury material”, used in the construction of jewellery, Palladium is favoured for computers, cell phones and televisions, along with other industrial uses linked to its ability to store hydrogen. Despite being a precious metal, Palladium doesn’t trade like one. Instead, Palladium tends to track the stock market. Its industrial uses tend to overshadow its status as a rare metal. So, one of the best ways to use Palladium charts is to spread it vs. Gold. 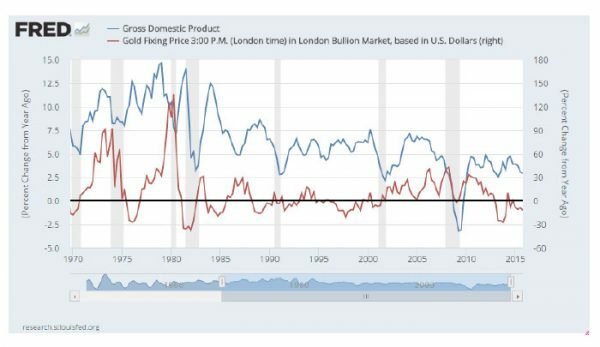 This shows how well the industrial (real) economy is doing, and the Palladium/Gold spread will turn bearish quickly when the economy starts to slow down. On the one hand, you have diminished demand for consumer products, which impacts the demand for Palladium. On the other hand, you have a typical flight to safety reflected in the rising gold prices. 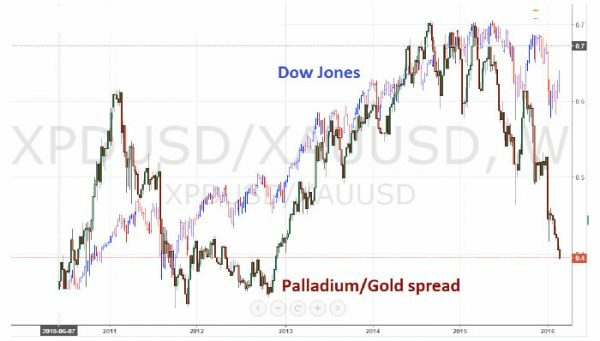 Palladium/Gold spread vs. Dow Jones. The cyclical nature of the spread is quite clear. Platinum is also a rare metal, and is also used for jewellery. However, just like Palladium, it has industrial uses that overshadow its status as a rare metal. Platinum is used in the automotive industry, and in the medical industry. 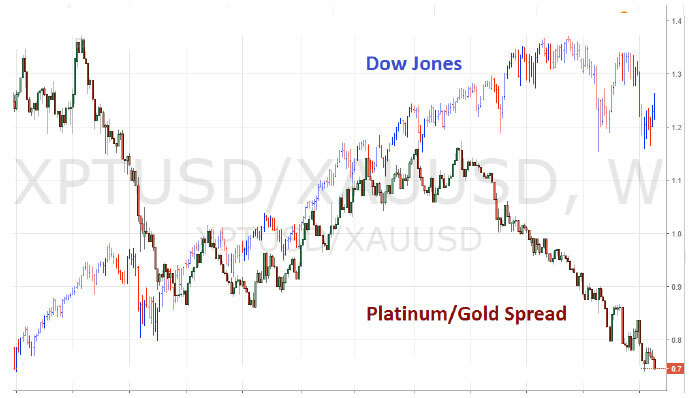 Again, Platinum trades like Palladium but it tends to be more sensitive to economic shocks. 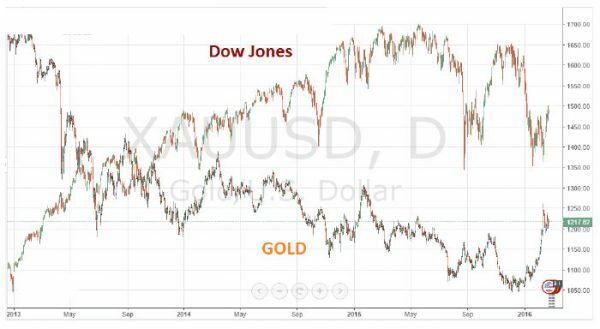 Its spread vs. Gold is a much better reflection of what market participants think about the future prospects for the economy. Platinum/Gold spread vs. Dow Jones. The cyclical nature of the spread is quite clear. It tends to anticipate and exacerbate trends in stock markets. Precious metals are an important source of diversification for traders. 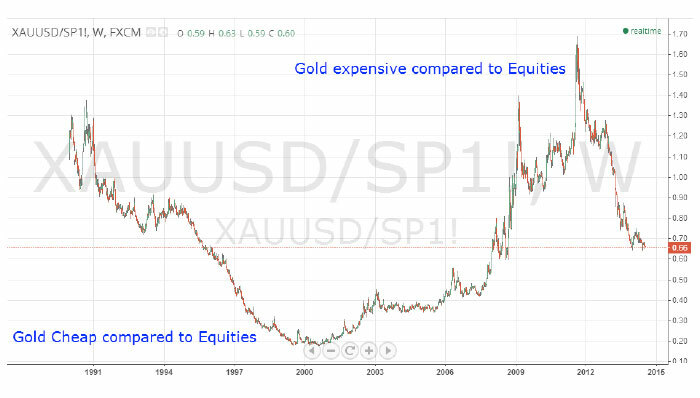 Gold has been a protagonist for hundreds of years, and has only become a free-floating commodity since the 1970s. Gold has 4 main drivers, and trades on macro issues, acting much more like a currency than anything else. But by keeping an eye on Central Bank operations, USD dynamics, inflation and risk appetite, all metals become instruments to enhance your trading results.